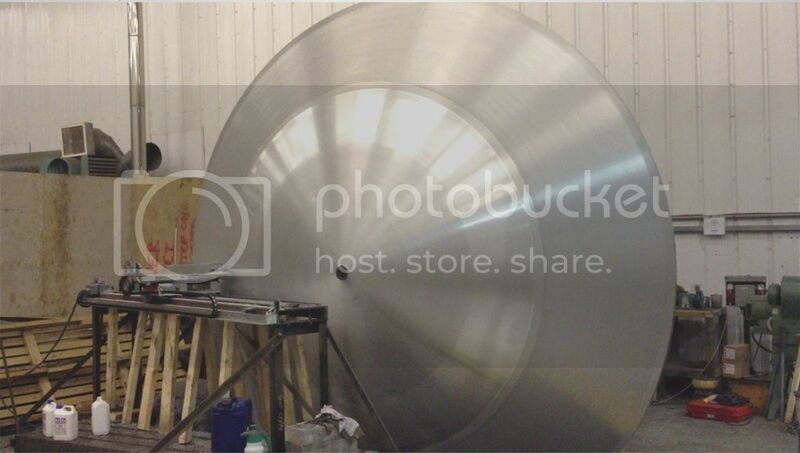 This is the story of how we built one of the largest spinning tools you are ever likely to see. 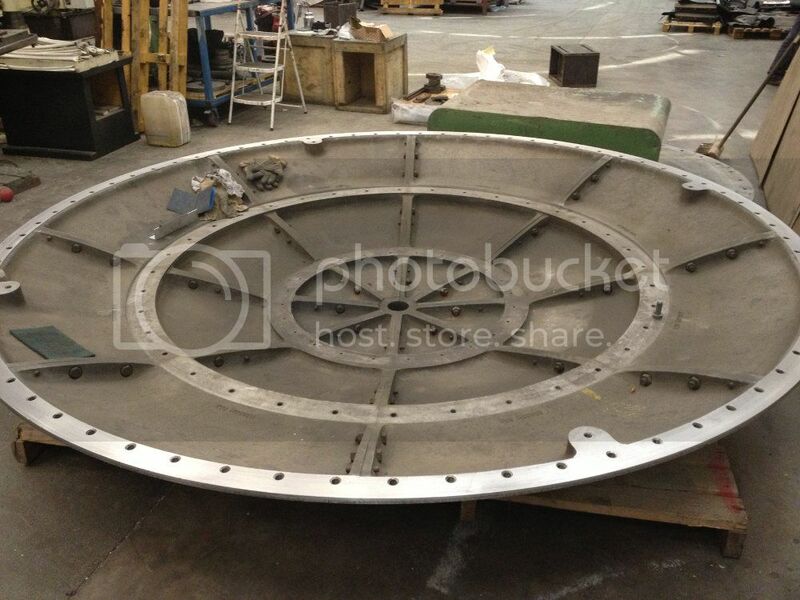 This is a parabolic spinning tool for making aluminium reflectors for satellite antennas and weather radar systems. It weighs around 2.5 tons. We had a 3.0m tool which was bought as part of a factory closure. 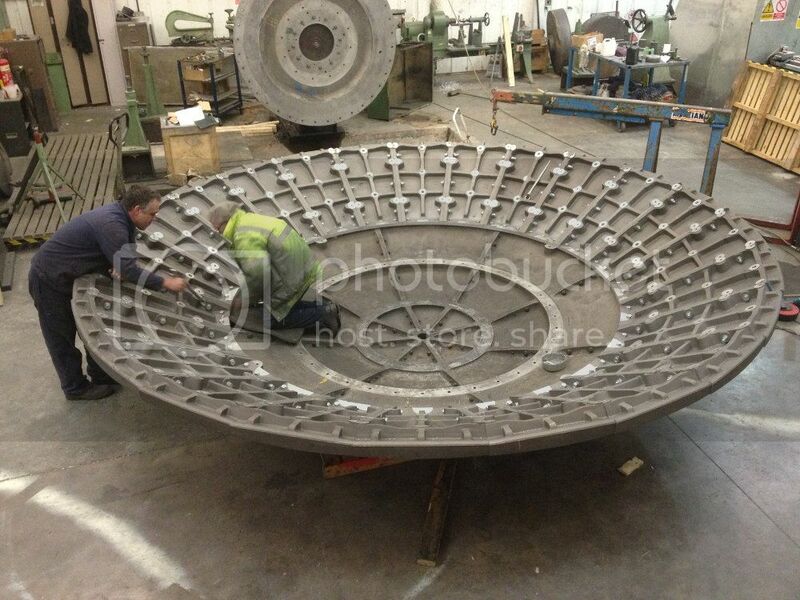 it had originally been the centre of a 4.5m tool, but the outer segments had been scrapped. so we had to remake them. It was no small job. Fig. 2 After making a pattern and having the new segments cast, the machining references were milled and holes tapped for fixturing. They were milled on a large 3-axis machine, tilted as they would be in service to allow the sides to come parallel when assembled. Fig. 4. The tool in position on the lathe headstock where it will be used, driven at around 60RPM using a 20hp motor. Note the pit needed to clear the tool to put the axis at a workable height. Fig. 5. Turning the tool. The 2-axis slide is not at 90 degrees to the machine axis as this would require too much slide movement, Instead a minimal Y axis moving only 300mm or so is used, and an angular offset applied. The software is used in mill configuration using the radius of the lathe tool tip as an offset. Fig. 6. The finished tool With its eventual operator for scale. Programming was simple since a parabolic curve is simply defined mathematically, so parametrics are used to recalculate the next pair of X and Y coordinates based on a subroutine that runs several times a second to change the value of two parameters which are then translated to X and Y before movement. The program as it was run was about 30 lines long. This and the angular offset made the programming easy. Turning took six days, day and night. This was a long job and the first I've seen where the job was bigger than the machine! a number of visitors called their friends and just said "get down here. You've got to see this". 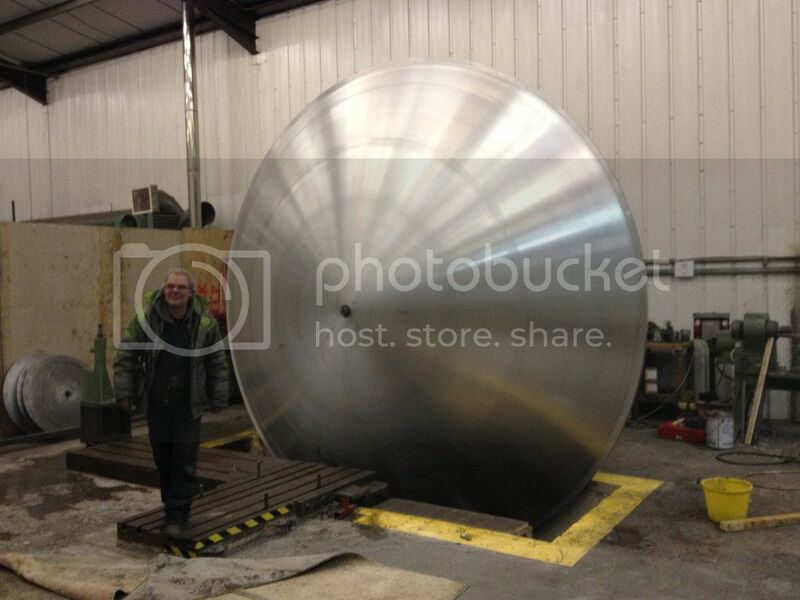 As far as we know this is the largest metallic spinning tool in europe - and it was made using Mach3. Thanks for posting as it's always nice to see some "big" things being made. Thanks for sharing. Love seeing jobs where you have to think outside the square to get them done. I had the oppitunity years back to visit my brothers machine workshop before he passed away and he was refacing a 6.5m dia cable spool that sat on the top of a coal mines dragline. The spool took a week to position onto a 2x post horizontal lathe. To align the spool to the face plate, you walked down a tunnel and into the centre of the machine. 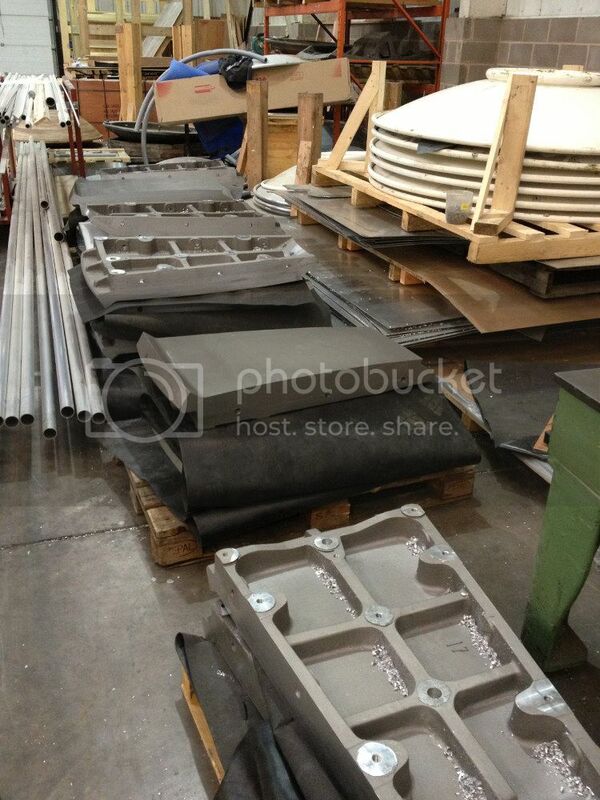 Special wedges were placed around the machine to adjust the runout before machining. 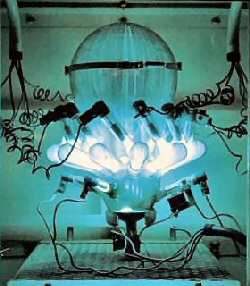 The day I was there, I was watching in awe, as the twin cutters were creating razor wire like swaf. I can't remember how long the machining took, but it was a continuous 24hr shift for the guys till it was finished. He also told me that the lathe ran off a huge style battery bank. The reason for this was in case of a power outage, the battery system would allow enough time to back the cutters off the job, otherwise the cutters would get smashed due to the depth of cut they were taking. It certainly made my machining jobs pale into insignificance. Great post! Thanks for taking the time to share it with us. I'd love to hear more about the hardware side...what kind of servos, amps, etc were used. Thank you for bring back memories of my life in the Satellite Ground Station industry here in Australia. I was a humble RF Technician running the Satellite Ground Station Manufacturing facility for a company here in Brisbane. I used to manufacture Frequency Converters (and other related equipment) in all bands for Australian communications companies. It was during my time at this company that I became fascinated with CNC machines, I could watch them for hours. The workshop supervisor (Dave) was a very talented British machinist who became my mentor in things mechanical. He earned my total respect during my time there and among many tricks, taught me how to rough sketch (with a pencil and paper) and get my ideas across to the workshop. 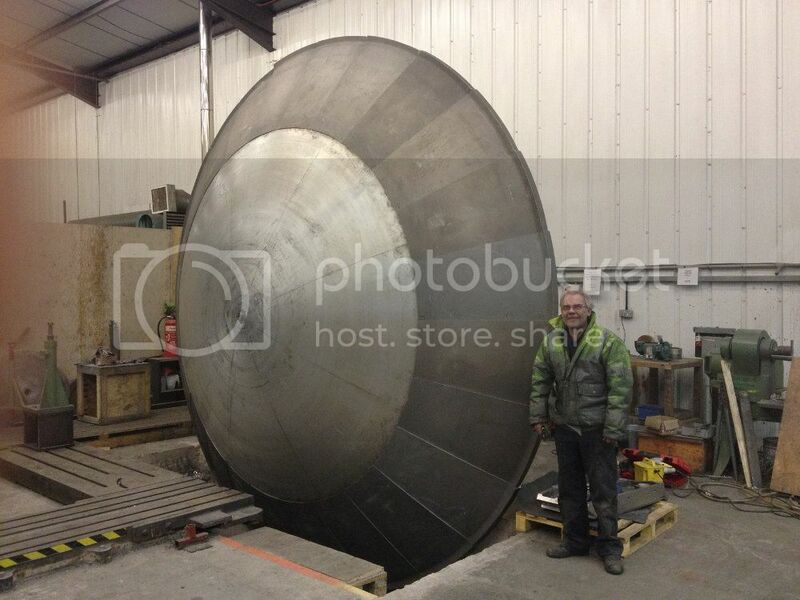 Dave used metal spinning companies to make dishes up to 2 metres after he managed the manufacture of wooden formers. He also made small dishes from aluminium blanks that looked like pizza trays. He used water pressure to form the dishes to the correct shape. This process is known as hydraulic forming. Once again thank you for posting this. This process is known as hydraulic forming. This is exactly what I envisioned 4.5 meters of awesome would look like! Way to go, thanks for sharing! The motors are actually fairly small, I can't find the specs for these just now but they are about the size of 2 tuna cans, and standard 200 steps/rev. They are very strong though, magnets have improved since my mill was built. They are each geared down 4:1 to a 5tpi 25mm ballscrew. The bearing blocks, rails and ballscrews are all from HiWin. The stepper driver is a RoutOut unit similar to the one on my mill. It didn't need to move quickly, just steadily and accurately. The wood stuffed under the rail was to damp a vibration which occured periodically as turning progressed. The setup lacked rigidity and if I was to do it again I'd fabricate a rail based on some of the 20" hot finished steel CHS we use here, and probably filled it with concrete. We also experienced resonance in the tool and were forced to adjust the spindle speed to dial it out. It was quite a job. I needed a good long sleep afterwards. Afterwards we removed 600kg of swarf from the pit. Chrisjh - Both techniques are still in use, we spin ours but larger sizes are hydroformed here and in the US. Stretch forming is also widely used, it works for the bigger segmented reflectors. Composites are also widely used but they have problems all of their own. That is just a little bit over the top!